The Maria oil discovery is located in 350 m of water in the Haltenbanken region of the Norwegian Sea. 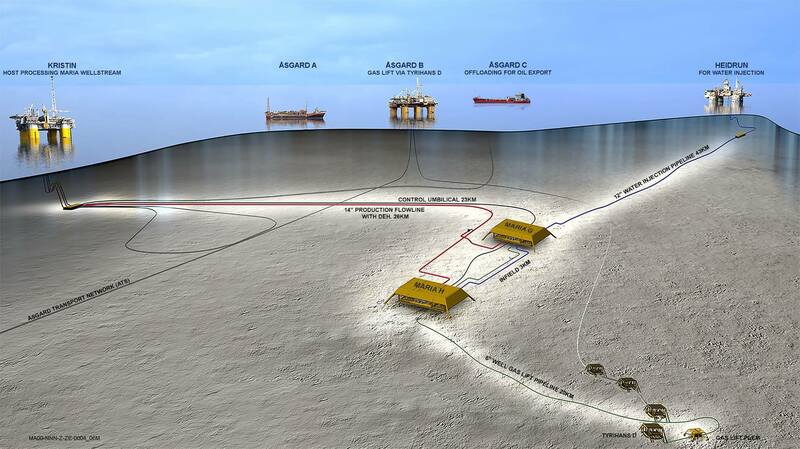 It will be developed and operated by Wintershall Norge AS. The development strategy is to produce oil with the assistance of gas lift to the Kristin facility, using four oil producers and two water injectors. The water injection acts to maintain reservoir pressure. Two additional slots prepared for water injection wells or production wells, this provides robustness to requirements in the drainage strategy during operation. Maria will be developed using a subsea facility tied via rigid flowlines and flexible risers to Kristin with gas lift being supplied from Åsgard B via Tyrihans and Sulphate reduced sea water supplied with injection pressure from Heidrun.